Break into Mercer Frey's house and search for clues. Enter The Ragged Flagon through The Ratway. Meet Karliah in The Ragged Flagon. Speak with Brynjolf in The Ragged Flagon. Go to the backyard of Riftweald Manor. Enter the house through the top door. Head to the Ragged Flagon through The Ratway. Meet Karliah after entering through the door to the Ragged Flagon and follow her as she leads you to the Cistern, where Brynjolf, Delvin and Vex are waiting with knives drawn. Karliah pleads clemency and hands over the journal you translated in the previous quest as proof of her innocence. Brynjolf is shocked at the revelations contained within and determines that they must open the vault to see the truth. Follow them as they head to the vault and watch as Delvin and Brynjolf use their respective keys to open it. As soon as the doors open, Brynjolf will let out a cry of horror at seeing the place completely empty; not a single gold coin is left. Whilst Delvin is distraught at seeing their fortune gone, Vex's reaction is more violent; she pulls her dagger out and vows to kill their treacherous Guildmaster immediately. Brynjolf manages to calm the situation and asks to talk to you after assigning the other two to keep an eye out for Mercer. Tell him everything and he'll instruct you to break into Mercer's home to look for clues. However, the place is guarded by a Nord lout named Vald who is quite insistent on keeping people out. Brynjolf suggests you speak to Vex about him, since she was at one point intimately acquainted with Vald. Vex suggests the best course of action would be to erase his debt with Maven Black-Briar or run him through and take what you need off his body. You must pass a hard-level Speech check to persuade him to give you the key. I have something of yours. Here, it's your debt with Maven. You're free. Of mine? What is it? I can't believe it! How did ya' talk her into this? Never mind, I don't care. I'm just glad I don't gotta' work for Maven anymore. Here, ya' did me a favor, I guess I owe you one. I'll watch it for you. Passed: But I can't leave here! I'm supposed to watch his house. What do I do? Wow, sure is nice of ya'. Here, hang on to the key and don't let anyone in! Failed: Oh come on, I ain't that dumb. If you want a nonviolent way to deal with Vald but don't want to pay the debt, you can sneak to the back of the house and shoot the ramp contraption. Vald will become hostile and chase after you. Lead him to the marketplace or any other area with guards and they will kill Vald. Loot his body and take the key. It is also possible to climb up the exterior of the Temple of Mara, by jumping onto the braziers and from there scaling the roof. From there, you can use Whirlwind Sprint to reach the balcony without ever interacting with Vald. Get a good vantage of the mechanism under the ramp and attack it using a ranged weapon (magic, bows, and shouts all work). The ramp will crash down, providing access to the second floor and the rest of the house. The first room is unguarded. The next has a single guard who should be facing the west wall, allowing you to sneak past easily. The stairs down are to the northwest. At the bottom, another guard will be patrolling. When you reach the bottom of the stairs, immediately face east and there will be closed doors. Head through them. On the northeastern corner to the barred front door you'll see a Suspicious Cabinet. Open it and then open the false back panel. Inside is a stairway down to the cellar, which leads to an underground system of tunnels. After avoiding the pressure plate by the metal gate that you see when you first enter the tunnels, make a left and head south towards a room filled with circle-shaped traps. Looking at the tiles, head south two squares, west two squares, north two squares, west two squares, and south two squares in order to avoid the traps. The hallway after the trap room has a pressure plate trap right around the corner that will launch a series of darts in front of the plate. Past this trap there is a chest on the right, which was on the other side of the metal gate at the beginning. Following the hallway, you come to a hallway filled with timed pendulum blades and battering rams. Sprinting is a useful way to get past them. Once at the other end, head down the ramp and stop at the closed door. There is a dart trap trigger on the left side of the door. On the other side of the door are, among other things, Mercer's plans, a note titled Many Thanks, a copy of the Sneak skill book The Red Kitchen Reader, and Chillrend in a case. 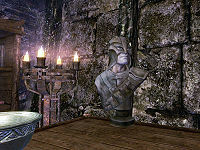 On the desk is the Bust of the Gray Fox, which can be sold to Delvin as part of The Litany of Larceny quest. There is also a stash of jewels hidden in the bowl on Mercer's desk. Continue along the path until you reach the entrance to the Ratway Vaults. Fall down the hole (you may be attacked by some Vagrants and Lowlifes even if you had previously cleared the Ratway) and turn right to reach the Ragged Flagon. Return to Brynjolf and hand over the plans. If you have picked the lock to Mercer's back yard, Vald will be hostile and offer no talk option for the peaceful solution. To fix this, close the gate and wait outside the yard until he stands in front of you, then talk to him through the gate. If Vald's debt has been cleared by fetching Maven her quill and the player decides to go with Brynjolf's suggestion of shooting down the ramp to the second floor, Vald becomes hostile upon seeing the player for "missing" the shot. There is a Sneak skill book on Mercer's Desk. It is possible to scale the roof of Riftweald Manor and approach the balcony from above, negating the need to activate the ramp. The quest marker in Riftweald Manor is not positioned at the quest target and is thus not useful here. Vald and the Marauders will attack each other if the player lures the Marauders out of the house. It's possible that Vald won't come talk to you at the gate when you bring him the note to clear his debt, becoming hostile towards you instead. This can occur if you've walked too close to the yard after the quest has started, but before erasing Vald's debt. Karliah sometimes is stuck at Winterhold Inn instead of being in the Ragged Flagon at beginning of the quest. This may happen if you leave the cellar before Karliah does or complete other quests before continuing with this one. A possible solution is to go to the Flagon and move her via console commands: prid 00058F1A to select Karliah, followed by moveto player to move her to you. You may need to manually advance the quest as well with setstage tg07 20. It is possible to re-enter the Dwemer Museum in Markarth. This will reset the previous quest; run all the way back up and get the translation off the stone in Calcelmo's tower again, and return to the inn in Winterhold. The conversation with Karliah and Enthir should now be reset. This time, when Karliah tells you to meet her at the Ragged Flagon, wait until she leaves the cellar, and then wait there for a day or so just to be sure. At this point the quest marker should appear in Riften, indicating that Karliah is now where she should be. This bug may lead to conversation options allowing the player to own more than one Nightingale Blade. If you loot Mercer's Plans from Riftweald Manor prior to completing Hard Answers you will be unable to progress through The Pursuit. Instead Karliah will stand outside Snow Veil Sanctum and not move or speak with you. If you down her she will go to reenact the events at the end of Speaking with Silence which will affect you as well if you are present. When you "awake" again you will again be prompted to speak with Karliah but she will be hostile. She will reset after a week and you can speak to her as if you never completed Hard Answers. Returning Mercer's Plans to his home prior to completing Hard Answers again will restore the quest chain. This issue has been addressed by version 1.0 of the Unofficial Skyrim Patch; The barrel people were using to gain early access to Mercer's House has been moved away to avoid this very situation from happening. This bug happened because Mercer's Plans is in your inventory. Drop it and enter console command setstage tg07 10 will start the quest normally. If you accept a quest from Vex after the vault but before you talk to Brynjolf, you may not be able to speak to her about Vald. Though there will be a quest marker above her head, you will not get the option when speaking to her. If you opened the door to the garden before starting the quest, you have to close it again. Otherwise Vald will become hostile on sight. Using magic to pacify him might give you a chance to get into dialogue with Vald. If successful he will also probably leave after ending the dialogue without any more hostilities. There's a chance that neither the front or back gates to Riftweald Manor will become accessible, nor can the plank be shot down by an arrow. Vald will also refuse to talk to you regardless of whether or not you complete Vald's Debt quest. If this happens, the only way to proceed forward is to scale the rooftops to the upper balcony, where the plank would have fallen if shot by arrow. This is the only door that will open. The quest will fail to properly update to stage 50 if you enter Riftweald Manor any way other than the door at the top of the ramp. To prevent this, make sure you enter or exit the manor from that door before going into the treasure room and picking up Mercer's plans. ? If you attempt to give Delvin Mallory the amulet from the quest The Silence Has Been Broken during the time in which Karliah should start talking to The Thieves Guild, at the beginning of the quest, she may inexplicably travel to a random location half way between Shor's Stone and Fort Greenwall (Or another random location). ? If this happens attack her a few times, and eventually she will kneel, after a recuperation period she will get up (she may be hostile, either calm her or attack her again). You may need to repeat, but eventually she will no longer be hostile and begin to walk towards Riften. Fast travel there and enter The Ragged Flagon through The Ratway as normal. By the time the player gets there the quest should have updated to "Speak with Brynjolf." This bug is denoted by strange quest markers such as:(Follow Karliah being the active quest) from The Ragged Flagon to The Ratway Vaults to Riftweald Manor, however upon exiting to Riften the quest marker should be at her correct location on the world map. 10 I'm on my way back to the Ragged Flagon to meet up with Karliah. Using the information obtained from Gallus's journal as proof, I hope to convince Brynjolf of Karliah's innocence and Mercer Frey's betrayal. 30 Brynjolf has been convinced of Karliah's innocence and Mercer's betrayal after investigating the Guild's treasure vault and finding it empty. Of greater mystery is the fact that the vault can only be opened with two keys and is utterly impervious to lockpicking. How Mercer Frey could have breached it is a mystery to us all. 40 The hunt is on and I'm on my way to Riftweald Manor, Mercer Frey's estate in Riften, to locate a clue as to his current whereabouts. 60 I've discovered some plans in Riftweald Manor. This must be where Mercer Frey is headed. I should bring these the Brynjolf as soon as possible. 200 Finishes quest Brynjolf is convinced Mercer Frey intends to perform one final heist before departing Skyrim for good. According to the plans I discovered in Riftweald Manor, he's after the "Eyes of the Falmer," two gems of enormous value. If we have any hopes of intercepting Mercer, we need to proceed to their location immediately. The following empty quest stages were omitted from the table: 0, 25, 45, 48, 49. On the PC, it is possible to use the console to advance through the quest by entering setstage TG07 stage, where stage is the number of the stage you wish to complete. It is not possible to un-complete (i.e. go back) quest stages, but it is possible to clear all stages of the quest using resetquest TG07. This page was last modified on 22 March 2019, at 14:22.